Visitors have accessed this post 2321 times. This tutorial will show you how to use the Modal Forms in C#. in C# instead of using a method “Show()” we will change it into “ShowDialog()”method and this creates a Modal form. 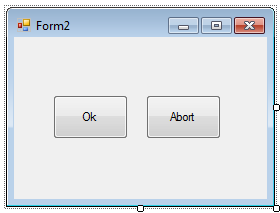 This Modal form is something you need deal with before you can proceed with your program process. In C#, a ShowDialog method has an optional argument that can be used to specify a parent-child relationship for a form. The code above will simply checks to see if the OK or the Abort button is clicked. If so, it display a message. you can now try to run the application and test it. 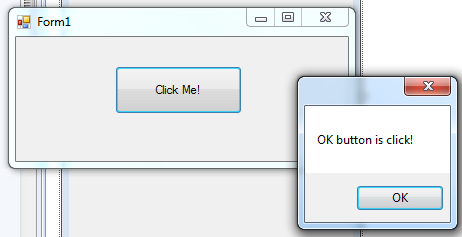 In my example, I just simply click the “OK” button and the output looks like as shown below.